Shutting down our government is how our elected officials have decided to work out their differences in Washington. I could go on and on about how childish and immature this course of action is, regardless of who is at fault. For your sake, I won't. However, the question has come from many clients - "how is this going to impact my portfolio?" A valid question, and to that - an answer. 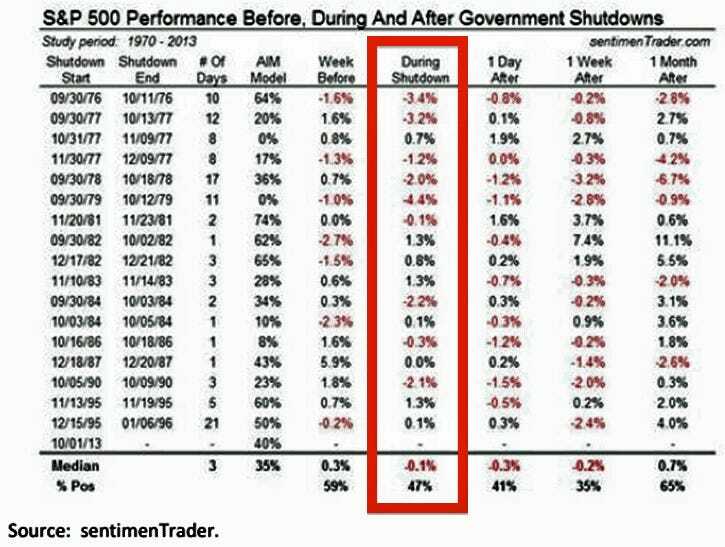 Consider the following chart, courtesy of SentimenTrader, showing the S&P 500's performance before, during, and after previous government shutdowns. What does it tell us? At first glance, not much. Market performance during shutdowns has been basically even, with positive performance seen during nearly half of the previous shutdowns. Perhaps the lack of any meaningful pattern here is useful to us in itself - further validation that government shutdowns, while an embarrassment for our elected officials, are no cause for panic - merely an opportunity for investors to remain focused on their long-term goals.